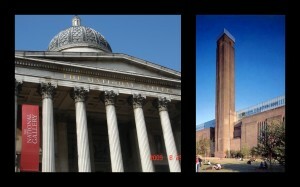 So this is an overdue post comparing our experiences at the National Gallery and the Tate Modern. When we were climbing the steps of the National Gallery we were anticipating the beautiful pieces that would be displayed by world renowned artists. We were excited to see the works of Van Gogh, Da Vinci, Van Dyck as well as artists who are unfamiliar to us. While standing in front of Da Vinci’s Madonna and Child, observing his rather passionate and intricate work we felt a disconnect between our previous assumptions of how the work was suppose to affect us versus our actual interpretations. Based on our shared knowledge of these artistic “masterpieces” we hoped to feel the sense of awe. Although we were privileged to be viewing these works, we left feeling rather “eghhh” (for lack of a better term). Our experience at the Tate Modern JUXTAPOSED our feelings of incomplete satisfaction at the National Gallery. We were immediately intrigued by the modern and uncommon artistic works. These revolutionized pieces made us question the true meaning of art. IN our interpretation of the works found at Tate, modern art in Britain completely attempts to move away from traditional, classical art found at the National Gallery. Although we do appreciate classical art, modern art speaks to us in a different form, and it relates to the ways in which we seek to see the rest of our society— in distinctive ways. The Tate Modern seems to be “pushing the envelope” when it comes to artistic expressions and we enjoy that sort of rebellious attitude. Overall, art is an interpretation of the individual and it can exist in various forms. It is always inspired and interpreted.